§ 61.1 Applicability and definitions. (1) The requirements for issuing pilot, flight instructor, and ground instructor certificates and ratings; the conditions under which those certificates and ratings are necessary; and the privileges and limitations of those certificates and ratings. (2) The requirements for issuing pilot, flight instructor, and ground instructor authorizations; the conditions under which those authorizations are necessary; and the privileges and limitations of those authorizations. (3) The requirements for issuing pilot, flight instructor, and ground instructor certificates and ratings for persons who have taken courses approved by the Administrator under other parts of this chapter. (1) Aeronautical experience means pilot time obtained in an aircraft, flight simulator, or flight training device for meeting the appropriate training and flight time requirements for an airman certificate, rating, flight review, or recency of flight experience requirements of this part. (iii) A person authorized by the Administrator to provide ground training or flight training under SFAR No. 58, or part 61, 121, 135, or 142 of this chapter when conducting ground training or flight training in accordance with that authority. (C) That involves the use of dead reckoning, pilotage, electronic navigation aids, radio aids, or other navigation systems to navigate to the landing point. (B) Involves, as applicable, the use of dead reckoning; pilotage; electronic navigation aids; radio aids; or other navigation systems to navigate to the landing point. (4) Examiner means any person who is authorized by the Administrator to conduct a pilot proficiency test or a practical test for an airman certificate or rating issued under this part, or a person who is authorized to conduct a knowledge test under this part. (v) Has been evaluated, qualified, and approved by the Administrator. (6) Flight training means that training, other than ground training, received from an authorized instructor in flight in an aircraft. (iii) Has been evaluated, qualified, and approved by the Administrator. (8) Ground training means that training, other than flight training, received from an authorized instructor. (9) Instrument approach means an approach procedure defined in part 97 of this chapter. (10) Instrument training means that time in which instrument training is received from an authorized instructor under actual or simulated instrument conditions. (11) Knowledge test means a test on the aeronautical knowledge areas required for an airman certificate or rating that can be administered in written form or by a computer. (iii) Gives training as an authorized instructor in an aircraft, flight simulator, or flight training device. (13) Practical test means a test on the areas of operations for an airman certificate, rating, or authorization that is conducted by having the applicant respond to questions and demonstrate maneuvers in flight, in a flight simulator, or in a flight training device. (14) Set of aircraft means aircraft that share similar performance characteristics, such as similar airspeed and altitude operating envelopes, similar handling characteristics, and the same number and type of propulsion systems. 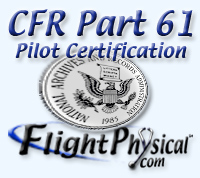 (ii) That includes a limitation for the operation of a light-sport aircraft specified in §61.89(c) issued by a certificated flight instructor with other than a sport pilot rating. (iii) In a flight simulator or flight training device from an authorized instructor.